DO YOU HAVE JERSEY-SIRED CROSSBREEDS TO REGISTER? Many commercial dairymen across Canada have been experimenting with crossbreeding, particularly with Jersey crosses. Jersey-cross animals are extremely popular in New Zealand, and are becoming more commonplace in the United States. If you have crossbred progeny, these can still be recorded. In the future, animal movement will be highly dependant upon unique identification and verifiable birthdates, so it is prudent to have papers on all dairy animals whether they are purebred or not. Requirements for official milk recording require 80% of first lactation animals to be identified to maintain publishable status for the herd. 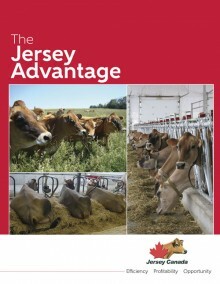 If you have progeny of a known Jersey sire, or a grade Jersey with breed characteristics, Jersey Canada can record that animal and issue a paper for her for only $9. This recordation program extends to progeny of Semex’s Repromax program which exhibit Jersey characteristics. For more information on crossbred recordation and Jersey Canada’s Grade-Up Program, contact the Jersey Canada Registrar at (519) 821-1020 ext. 101. Step 1. Base animals are recorded in the Jersey database at 0%. Base animals have a purebred Jersey sire, but an unrecorded dam or a dam of another breed. The cost to record base animals is $9 per female. Step 2. The offspring from a base animal (0% female) and a purebred Jersey sire can be recorded as a percentage animal at 50%. Recording cost is $20 per female. Step 3. Decedents from a 50% recorded female and a purebred Jersey sire can be registered as a percentage animal at 75% - and most shows accept Jersey animals at this grade level. Registration cost for members is $20 per animal and $31 per animal for non-members (if registered before three months of age). Step 4. Decedents from a 75% registered female and a purebred Jersey sire can be registered as a percentage animal at 87.5%. Registration cost for members is $20 per animal and $31 per animal for non-members (if registered before three months of age). Step 5. Decedents from an 87.5% registered female and a purebred Jersey sire can be registered as a percentage animal at 93.7%. Registration cost for members is $20 per animal and $31 per animal for non-members (if registered before three months of age). Step 6. Decedents from a 93.7% registered female and a purebred Jersey sire can be registered as purebred. Registration cost for members is $20 per animal and $31 per animal for non-members (if registered before three months of age).